The 40 Tenth Avenue building is a 10-story office building adjacent to the High Line and overlooking the Hudson River, in Manhattan. 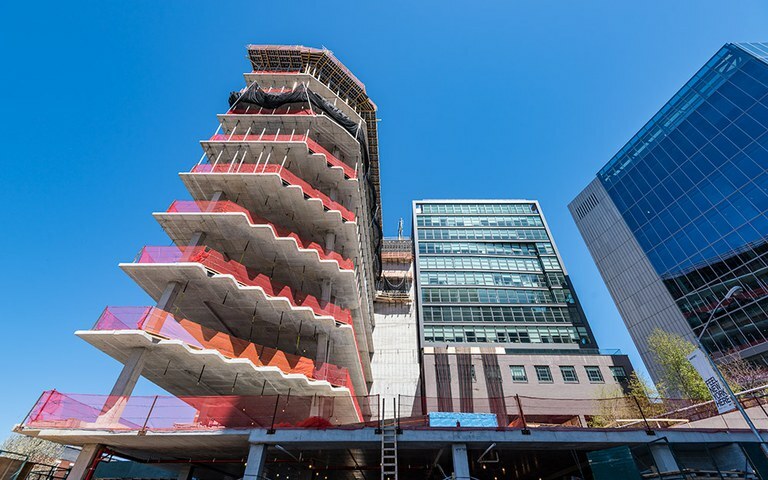 Located in Meatpacking District the office building has 139,000 square feet which include 20,000 square feet of outdoor space and 40,000 square feet of retail space with a large storefront facing 10th Avenue. The building was designed to have a positive impact on the environment and the façade is covered by glass with sheared corners revealing a truncated geometric pattern. The shearing was guided by the sun’s relationship with the area so that it would minimize shadows. 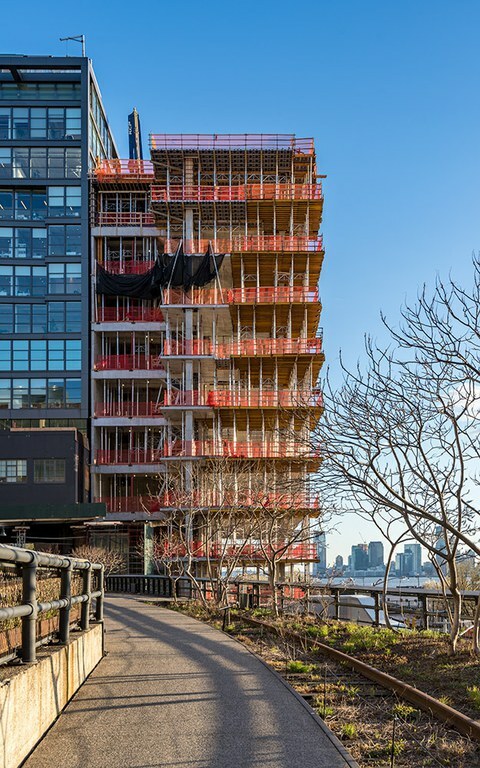 The solution adopted to build the 14,000 SQF floor plate spans was the combination between CC-4 Panelized Drophead Slab Formwork and ENKOFLEX H20 Beam Slab Formwork. For large slabs with regular geometry and spans between columns, CC-4 slab formwork was the best solution, bringing security and productivity at the same time. The system is easily dismantled for below without the risk of falls and the panels have incorporated the plywood facilitating the assembly and dismantling process. For the special architectural perimeter and corner conditions, the ENKOFLEX H20 system was best suited for irregular geometries to build the non-typical areas. The system is designed with independent and lightweight components and it is easily adaptable to any slab configuration. The customer can adjust the H20 beams to the different slab and heights configurations depending on the grid used. 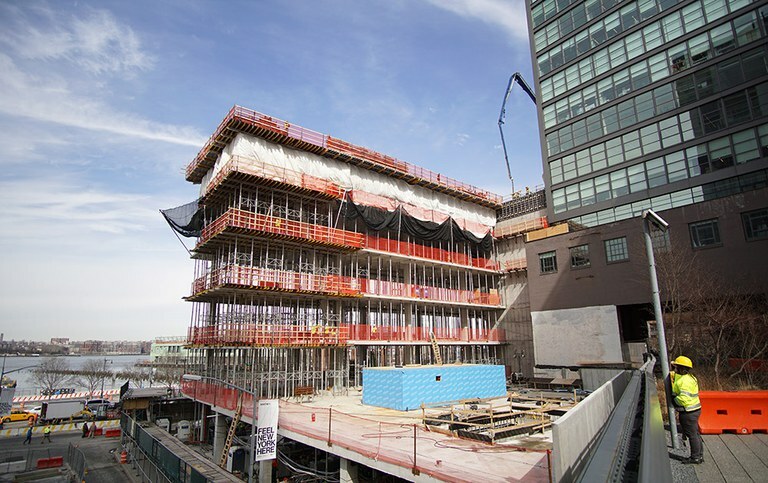 Both shoring systems are compatible and worked in combination to keep the work schedule pace. The ceilings raised as high as 17 feet and the ALUPROP Aluminum Shoring Post was the ideal system for that.